Symposium II, 'Ion Beams - New Applications from Mesoscale to Nanoscale', was held at the 2011 MRS Spring Meeting, April 25-29, in San Francisco, California. 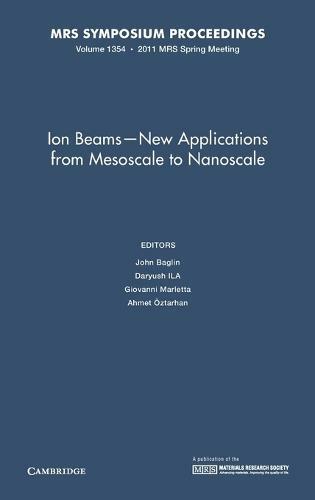 This symposium welcomed presentations on ion-beam engineering and characterization of materials properties, structure, topography and functionality, spanning dimensions from the mesoscale to the nanoscale. While the unique capabilities of ion-beam techniques in the diverse emerging fields of nanoscience and nanotechnology are fast becoming critical for many new applications, the flexibility of ion-beam techniques now enables the development of tools that can integrate tailoring of nanoscale patterns and structures with unique in-situ imaging and analysis. This recent evolution has energized new programs, both basic and applied, in fast-developing areas ranging over advanced semiconductor integration, information storage, sensors, plasmonics, molecular engineering, biomaterials and many aspects of the development of alternative energy resources. We should pause occasionally and review the overall state of the field, its emerging opportunities and challenges.